Furnace repair near me Archives - A.I.R. Plus Inc.
Natural Gas or Propane Furnace – Safety Check-ups and Performance Inspections! Natural Gas or Propane Furnace Carbon Monoxide Poison! How dangerous is it? Read the following from Oklahoma Natural Gas Co.
Natural gas is safe, clean and reliable. When appliances are installed properly and operating efficiently, natural gas burns cleanly, with little residue. However, if your natural gas appliance produces a yellow flame instead of a blue flame, it is not operating efficiently or is not vented properly. Carbon monoxide can be produced under these conditions. Carbon monoxide (CO) is poisonous. CO is an odorless, colorless and tasteless gas that can make you sick or, under some circumstances, cause death. Carbon monoxide occurs when fuel does not burn completely. To avoid CO hazards, make sure your appliances are properly installed, cleaned, maintained and vented. The sources of carbon monoxide can include improperly vented cooking and water heating appliances, auto exhaust, blocked chimney flues and malfunctioning fuel-burning appliances. Absence of draft in your chimney. Look for symptoms of carbon monoxide poisoning. Always be alert to the possibility of exposure to carbon monoxide. Learn to recognize the following symptoms of carbon monoxide poisoning. Initially, carbon monoxide poisoning can cause flu-like symptoms, including headache, dizziness, ringing in the ears, fatigue, increased perspiration, nausea, weakness and vomiting. As carbon monoxide levels increase, symptoms may become more severe and include shortness of breath, extreme muscular weakness, intermittent convulsions, mental confusion and unconsciousness. Severe poisoning can cause such symptoms as change in skin color to pink, lips and mucous membranes change in color to cherry red, and heart and lung failure. Immediately leave the building. Call 911 from a neighbor’s phone or call your local fire or police department. Or call Oklahoma Natural Gas at 1-800-458-4251. Do not re-enter the building until it has been determined safe by emergency response personnel. Immediately seek medical assistance for any symptoms, even those you think are minor. Make certain your appliances are operating properly, no matter what type of fuel you use. Check and maintain proper ventilation of the flue and chimney. 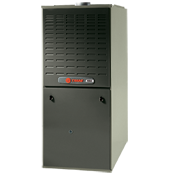 Have a qualified heating and cooling contractor inspect your gas furnace annually. If you see a yellow furnace flame instead of a blue one, it’s a warning sign that your appliance is not operating properly. Call a qualified heating and cooling contractor to inspect your furnace immediately. Clean or replace heating system air filters regularly. Do not block air intake areas near or around appliances. Do not use a natural gas range or space heater to heat your home. Do not start your car, lawn mower, snow blower or any combustion engine in a closed garage. Do not operate your grill inside an enclosed area. Carbon monoxide detectors can alert you to the presence of carbon monoxide. If you install a detector, follow the manufacturer’s directions regarding installation. Know the sound your detector makes when it goes off. Be able to tell the difference between your carbon monoxide detector and your smoke detector. Call (405)618-2AIR (2247) or (405)421-5191 today to schedule a Gas or Propane 26-point Furnace today. Free Carbon Monoxide test are performed on all inspections. Or go to //airokc.com today to schedule an appointment online.